It’s been six years since Code Climate introduced radically simple metrics for code quality: a grade point average (GPA) from 0 to 4.0 for repositories, and a letter rating for every file. Today, we’re going further by completely revamping the way we measure and track quality, and shipping a bunch of new features to go along with it. 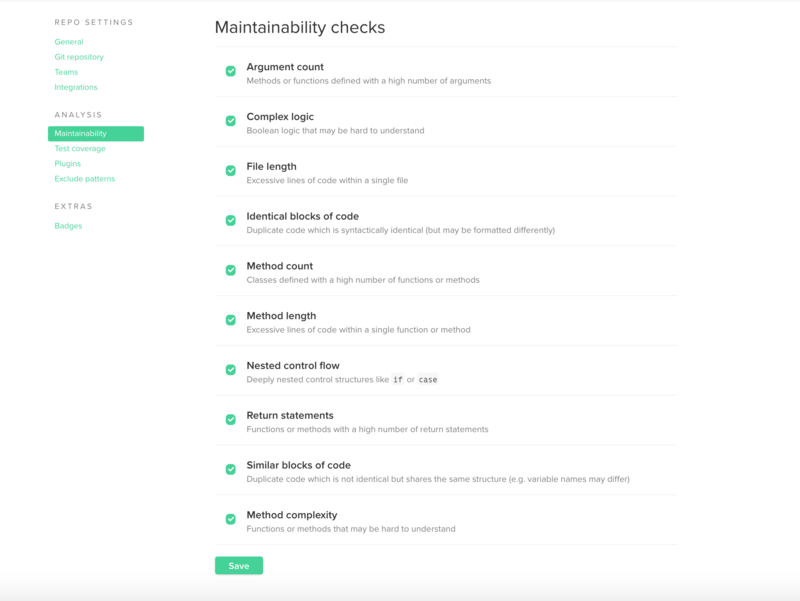 Maintainability: An estimate of technical debt in the repo based on our standardized 10-point assessment which looks at duplication, complexity and structural issues. Gone is the isolated Test Coverage tab, which was an additional place to get a full view of your overall quality. We’ve fully integrated test coverage information into the Code tab, and everywhere else. It’s now possible to control the way we analyze your code quality using simple, in-app configuration. Easily select which checks to run and exclude files that are not relevant. 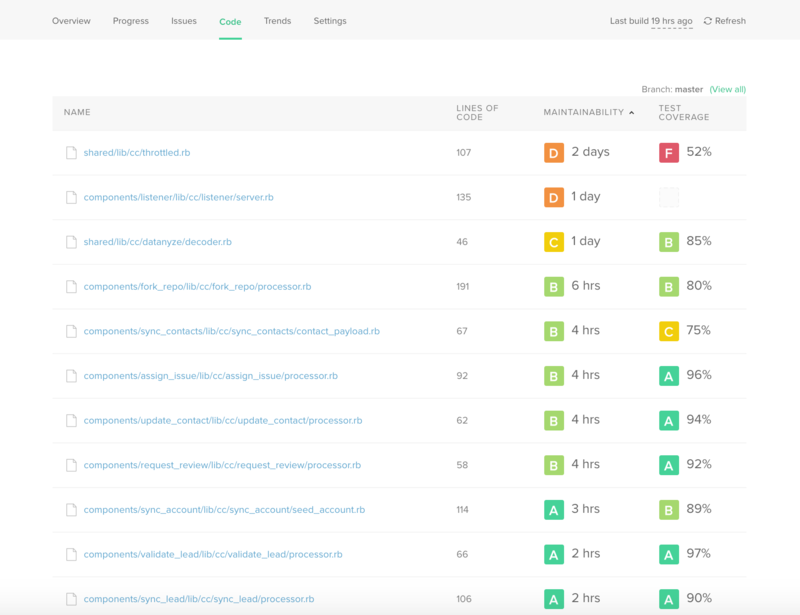 You can also easily browse and enable open source static analysis plugins, taking advantage of the 30+ tools that are compatible with our open, extensible platform. For those who prefer finer-grained control, or wish to keep their configuration in version control, file-based configuration using .codeclimate.yml remains available. If checked in, the .codeclimate.yml takes precedence over the in-app configuration. With all this new data available, we thought it was a great time to add some organization to the Trends tab. The left sidebar now makes it easy to get right to what you’re looking for. We’ve also added a new chart allowing you to see the total amount of technical debt in the project, and the overall project maintainability, all in one place. Alerts are sent when any letter rating changes, or any new files are created with “C” or lower ratings. We think this new functionality is an excellent complement to our recently-launched customizable issue alerts. Just head over to your API access page of your user settings area to generate a personal access token and get started. These features will be rolled out to all repositories on CodeClimate.com starting today. 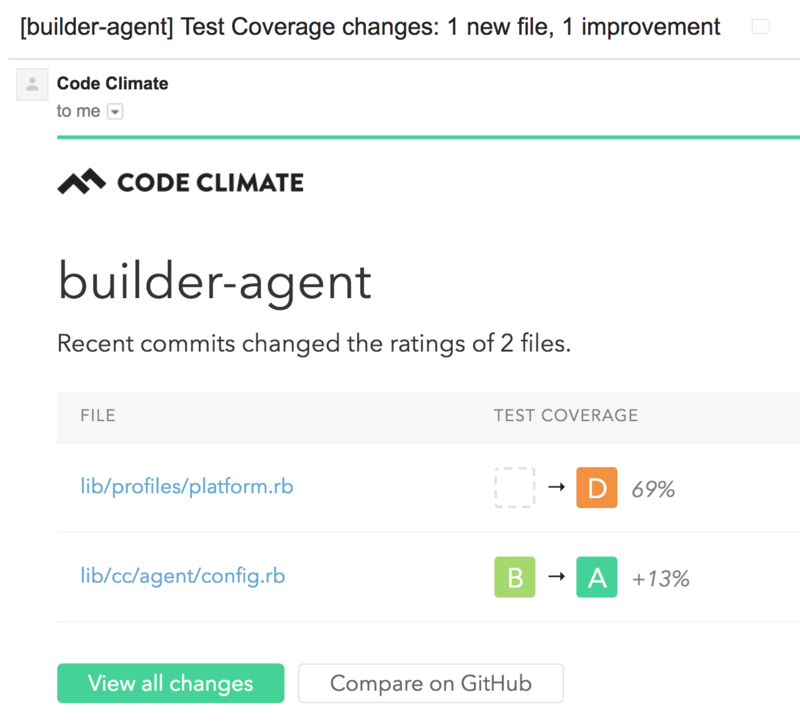 We hope you’ll agree that these changes represent a dramatic leap forward for Code Climate. As we’ve been testing this functionality internally and with a small group of customers, we’ve found it really changes the way we interact with code quality information day-to-day. There may be a few rough edges as we refine and polish some areas. As always, if you have any questions about anything, please don’t hesitate to get in touch. Our fantastic support team is always here to help.